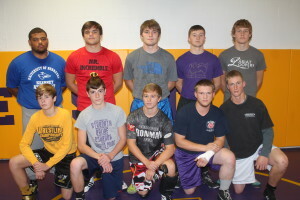 A new season will start soon for the Winner Area wrestling team. The Warriors will open the season at the Kimball tournament on Dec. 3. The Warriors have a new coach as Spencer Novotny has returned to his hometown to guide the wrestlers. The last six years Novotny was the wrestling coach in Mobridge. Novotny graduated from Winner High School in 2004 where was a four year wrestler for the Warriors. His freshman year he was a state qualifier, his junior year he placed fourth and his senior year he was state runner-up. His junior year, the Warriors were the state dual champs and his senior year Winner was the team champion. Novotny went to college at Dakota Wesleyan University where he wrestled for three years and was a national qualifier. Novotny student taught in Lead-Deadwood and helped coach wrestling. The returning letterwinners are Wyatt Turnquist, Trevor Peters, Atlas Willuweit, Damian Bingen, Tristan Watzel, Tre Doren, Jayden Schroeder, Kayleb Brozik, Avery Gilchrist and Riggin Shippy. Others on the team are Payton Antoine, Nick Blare, Chet Bryan, Noah Cerv, Landon Debus, Jaikob Week and Caileb Week. The Warriors have five returning state qualifiers. Turnquist and Schroeder both placed 8th; Brozik, 4th; Doren, 2nd as he was then wrestling for Lake Andes and Willuweit. Novotny says the team will be strong at the upper weights and the lower weights. In the middle will be a lot of younger wrestlers. The coach says the team has been working on technique as well as live wrestling. “I use live wrestling as conditioning,” explained the coach. Novotny says he has three goals for the team: Want to go undefeated in duals, win regions and be in the top 4 at state. Novotny’s assistant coach is Jayd Schuyler. Feb. 4—at Big Dakota in Stanley Co.